A strong password is crucial to preventing hackers from stealing personal and business data. Use these rules to improve your password strength and keep hackers away. The more characters a password contains, the harder it is for a hacker to crack using a brute force attack. Even if you use a totally random five character password that consists of uppercase letters, lowercase letters, symbols and numbers, like “g5!sR” it can be guessed rather easily. How Secure is My Password?, a website that helps you test password strength, estimates that even a simple password like “aaaaaaaaaaaa” is exponentially stronger, simply due to its length. 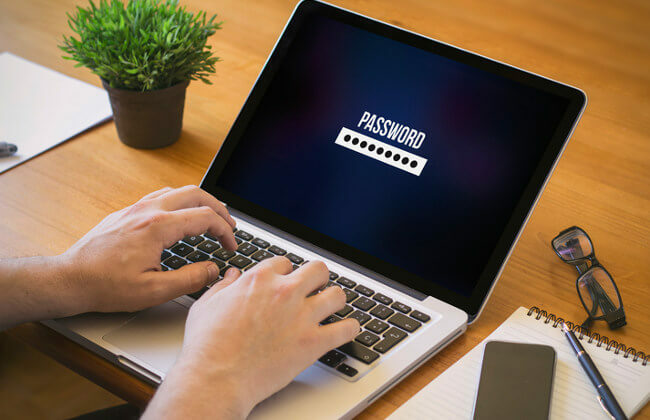 Many popular websites require a password of 6-8 characters, but we recommend bumping yours up to at least 10 for good measure. Just because character variation alone doesn’t equate to a strong password, doesn’t mean you should neglect it entirely. A long password with a healthy mix of uppercase letters, lowercase letters, numbers and symbols is even better. No first names, pet names, birthdays are allowed in your password. Anything related to you that someone can potentially guess is off limits. Tricks like these make it easier to remember your password, but they also makes it easier for hackers to infiltrate your account. A strong password is a random word or a random string of characters, completely unrelated to you. It’s a bad habit to use the same password for every account. All a hacker needs to do is crack one to hack all of your accounts. Use a password manager to store them safely. Two factor authentication adds an extra method of verification to your password. So, even if a hacker manages to steal your password, you can require most of your accounts to send a unique code to your cell phone as well, for example. It’s a common misconception that changing your password routinely makes it less likely that your account will be hacked. Frequent changes are actually counterproductive, because people tend to only change their passwords slightly with each update. Algorithms can easily predict the changes and anticipate the next password. The only time you need to change your password is if you suspect someone has stolen it. Understand that while a strong password is one of your best lines of defense against cyberattacks, it’s not the only one. You can follow every step on this list and still have your password stolen. Remember, holistic approach to cyber security, including an antivirus, email scanning software and behavior monitoring provide great support for your password. PreviousPrevious post:Windows 7 End of Life is Fast Approaching NextNext post:How Can You Unsend an Email in Gmail and Outlook? What is Sandboxing Software, and why is it Important for Cyber Security?